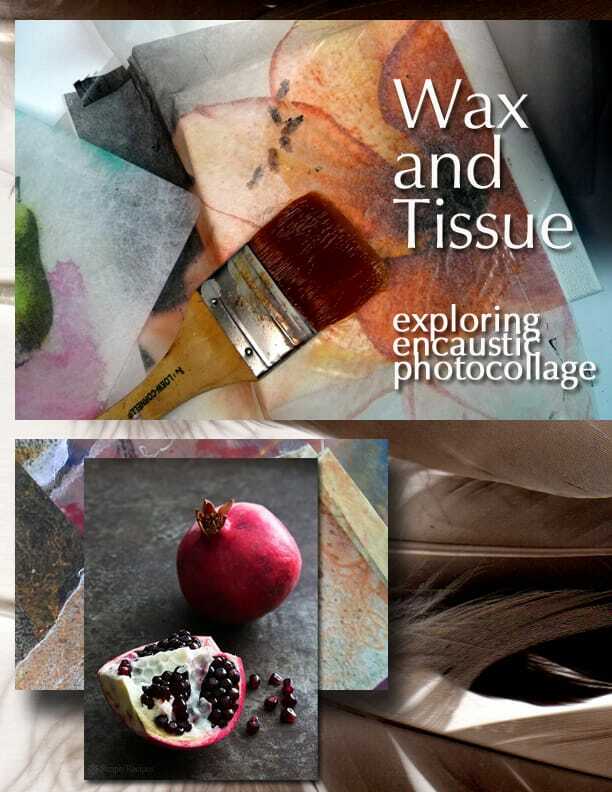 Wax and Tissue is an all-level workshop designed to intruduce you to simple encaustic techniques and tissue layering. This popular workshop allows you to use your own images or studio images to layer stories through translucent beeswax and mixed media. The Project – create a narrative encaustic collage that tells a compelling story using photos and textures. The Process – create two 5x7 encaustic collages on board. Learn how to print on tissue and how to layer it effectively. Enhance the wax and images with mixed-media techniques. The Goal – enjoy learning about the beauty of beeswax as a mixed-media tool while developing your skills in printing on tissue paper. Classes are limited to six participants, preferred method of payment is through Paypal because this insures your "place at the table" and makes bookkeeping easier. To be added to a waiting list, click here to email me and tell me what workshop you'd like to take in case of a cancellation. Workshops are held at Lyn's studio, 515-5 E. Olmos Drive, San Antonio, Texas. Click here for directions to the studio or call 210.860.9468.